Just for the record? I wanted this review to be titled "Disgrace to the Human Race," but the other she-OAFEs overruled me. When the local GameTraders was shutting down and everything was 50% off my boyfriend gleefully came home with his latest prize, this toy two-pack. 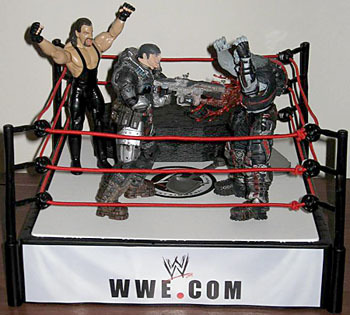 Apparently it re-creates "the most memorable and satisfying moments in Gears of War." Satisfying in the sense that it glorifies the horrific death that would result in literally splitting someone in half with the sharpest blade possible. 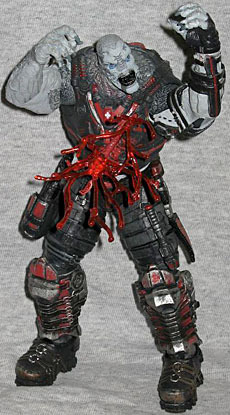 Now I'm not sure exactly what Locust did to Marcus but is sawing him in half with a chainsaw really fair? Do all heroes saw their enemies in half, I wonder? 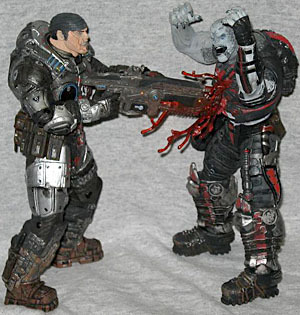 Marcus Fenix is first introduced as an inmate, serving a prison sentence for abandoning his military post in order to make a vain attempt to save his father, Adam Fenix. Prior to the Locust Invasion, Fenix is noted for having a famed military career, during which he played a notable part in the Pendulum Wars. 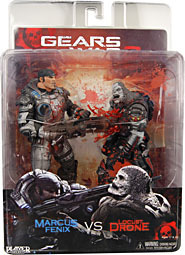 Despite this, Fenix is left for dead in a dilapidated penitentiary, until Dominic "Dom" Santiago, his friend and former comrade, saves him in the first act of Gears of War. After being freed from prison, Fenix is immediately reinstated into the military and is assigned to serve with Delta Squad. He is later promoted to Sergeant and becomes commander of Delta squad shortly after their previous squad commander, Lieutenant Kim, is killed by General RAAM. Fenix leads his comrades across the ruins of Sera, in an attempt to activate the light mass bomb against the Locust. I like the fact that the heroic Marcus avoids getting any of his enemy's blood near his highly detailed courageous and brave face. Meanwhile the enemy's colorful red blood, guts, veins and muscle tissue are suspended in mid air like a red explosion of string. Strange how Marcus managed to get so close to Locust that he could stab his futuristic chainsaw straight into his chest. The paint application on both characters is very refined and represents something truly obscene and reprehensible. The equally detailed but more unattractive grey enemy (Locust) looks very outraged, as this is occurring holding his arms, and massive fists in the air clutching at any hope of surviving being sawed in half. I also like the colour coordination of Locust's black, silver and red armored suit, which complements the gushes of his blood spilling in the air. His fashion sense is excellent. Marcus lacks this colour coordination as he only has a few splatters or sprays of blood. They appear to be sporting a similar brand of metal looking boot, however I feel Locust's boot contains a more fashionable buckle loop and strap combination. Also Locust did manage to coordinate his grey, ugly veined face so that it does match his outfit, which features grey and black tones. Marcus went for the more classic futuristic look of silver to look like a tinman on steroids. Now don't get too excited, unfortunately the articulation of the figure does not allow for Locust to actually split in half (sad). The chainsaw cannot move, I'm afraid. 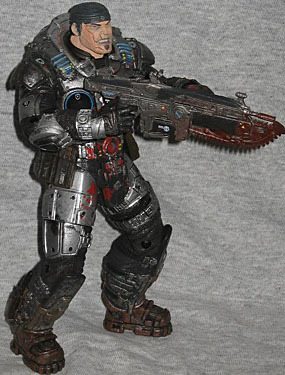 I am assuming that Locust's arm can move though, so he can reach two of his tiny guns strapped around his waist to defend him against the chainsaw which is 10 times as big. Like most figures, their heads can also turn around so they can look out for more chainsaw meddling maniacs. As far as playability goes, they can dance around your tabletop in a chainsaw massacre tango to your heart's content. It's a shame that they are stuck to each other until Marcus manages to saw all the way through Locust's body. Is this display of brutality standard when a hero takes down his enemy? What is the world coming to, really? Who buys something like this? What is wrong with them? Who is Missy? Find out here!